The last two days were an incredible time travel that gave us a unique insight into the architectural history of India. 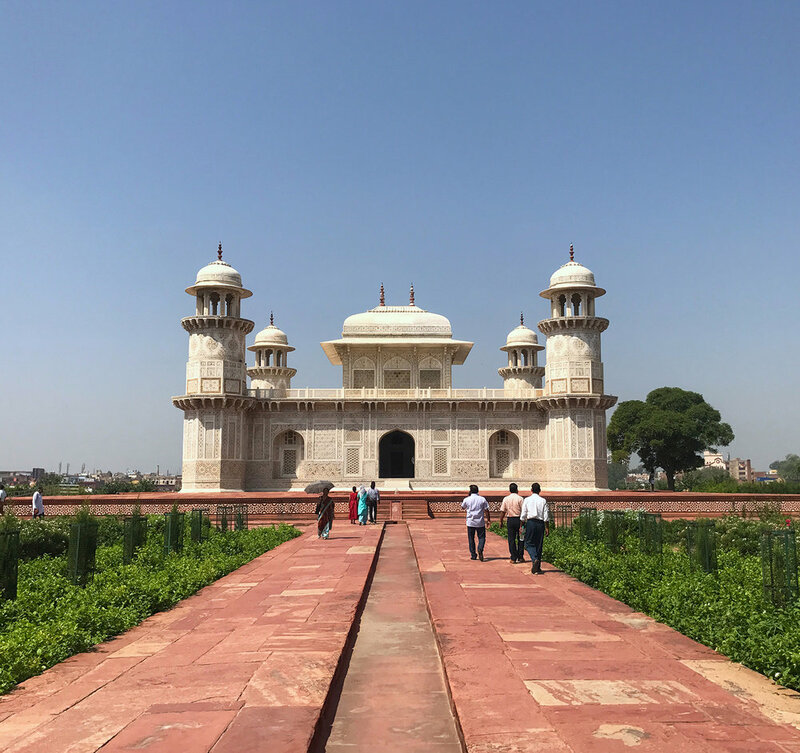 After a three-hour ride from Delhi to Agra we got off at the Itimad-ud-Daula mausoleum, aka Baby Taj. It is made of white marble with countless finely inlays consisting of colorful semiprecious stones. All made by hand in 1628!! A short ride in the air conditioned car gave us new energy and brought us to the Red Fort or Agra Fort. it's a massive complex full of details and ornaments. As the name indicates it’s mainly made of red sandstone, but has also sections of white marble. The Red Fort is so large we couldn’t take an overall view picture and the architecture and historical background are very diverse, so you better read it in your history book. After a short night we got up the next day at five o'clock in the morning so that we would be the first ones at the Taj Mahal. The Taj is a huge tomb built in the 17th century by the Mughal emperor, Shah Jahan, in memory of his wife, Mumtaz Mahal. Its ivory white marble shining in the first sunbeams is an unforgettable sight. The breathtaking dimension and beauty is extraordinary. And with only few tourists around the monuments atmosphere is even more fascinating. Here it is, the breathtaking Taj Mahal!